The second set of Thursday games is in the books, and boy were they uneventful. Once again, there was one somewhat competitive game — Marquette eventually pulled away from Kentucky to advance — and several blowouts: Pittsburgh, Purdue and UNLV all cruised to victories. We’re just hours away now from what, in my opinion, is the best two days in sports — the first round of the NCAA tournament. The big question, as always, is who the hell is going to win this monumental playoff? The prevalent choices right now seem to be North Carolina and UCLA — the number one seeds in the East and West regions, respectively. As I noted in my last post, the wacky formula I drew up and tweaked continually throughout the year in an effort to “crack” college basketball did just okay in terms of picking the winners of the conference tournaments. All in all, we were on the right track — correctly forecasting the winner outright or the sleeper team that won an automatic berth — in 14 of the 30 tournaments and finishing with a “winning percentage” that was a shade under 70. Is this by any means great? I’d have to say no. Still, when applied to the entire college basketball season to this point, the formula appears to have some relevance. 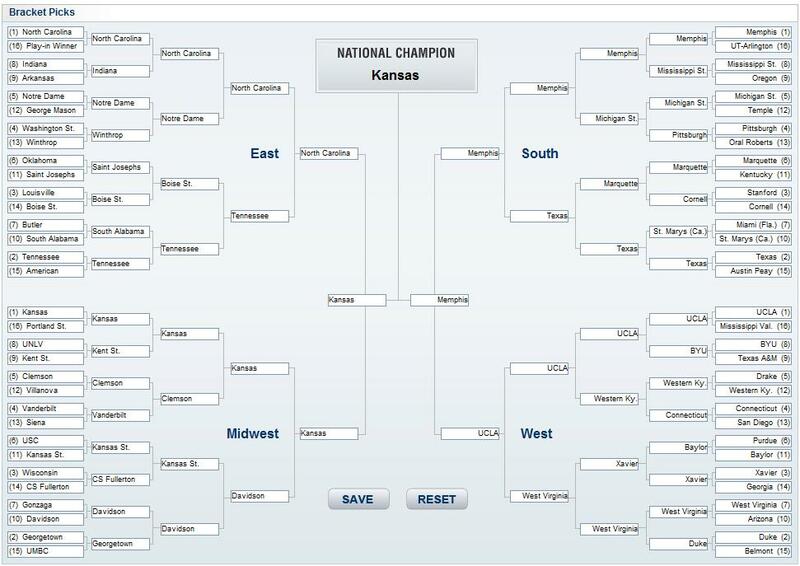 To wit, of the 65 teams in this year’s tournament, it lists the top three teams as Kansas, North Carolina and Memphis. (Trendy sleeper Davidson is listed fourth, but is followed by Tennessee and UCLA.) Of course, it should be noted that the metric doesn’t do anything to take into account schedule, or where games are played. Thus, as demonstrated to some extent by Davidson — some may argue Memphis as well — the obvious flaw with this metric when analyzing a tournament such as this one is that a team can be rewarded for playing in a conference without any legitimate challengers to its dominance. In an effort to at least somewhat neutralize the effect of a quality team dominating a bad conference, I decided I would integrate the Pythagorean theorem of basketball into the equation. Essentially, what I’ve done is taken the number produced by the old, wacky formula and multiplied it by a team’s Pythagorean winning percentage. The idea behind this is twofold. First, Pythagoras tends to be a pretty good forecaster in terms of basketball. Last year, it correctly predicted an NBA championship for the San Antonio Spurs and a return to the NCAA championship game for the Florida Gators. That’s not to say it’s perfect — the Gators were to be upended in the title game by Texas A&M, while the Spurs were to defeat the Chicago Bulls in the NBA Finals. Still, the metric has been on the right track more often than not of late. Secondly, it takes into account margin of victory. If a team had a weak schedule, but won most of its games in blowout fashion, Pythagoras rewards them. Similarly, if, for example, Davidson lost badly in some non-conference games, the formula would reflect that and detract from any blowouts in conference play. Again, it doesn’t adjust for strength of schedule, but it does take into account strength of victory, which the original formula does not place enough emphasis on. With all of this in mind, I decided to fill out a bracket with the “straight formula” and another bracket with the Pythagoras-modified version. My hope was that it’d help me find some teams with Cinderella potential. First, we’ll look at the “straight formula” bracket. 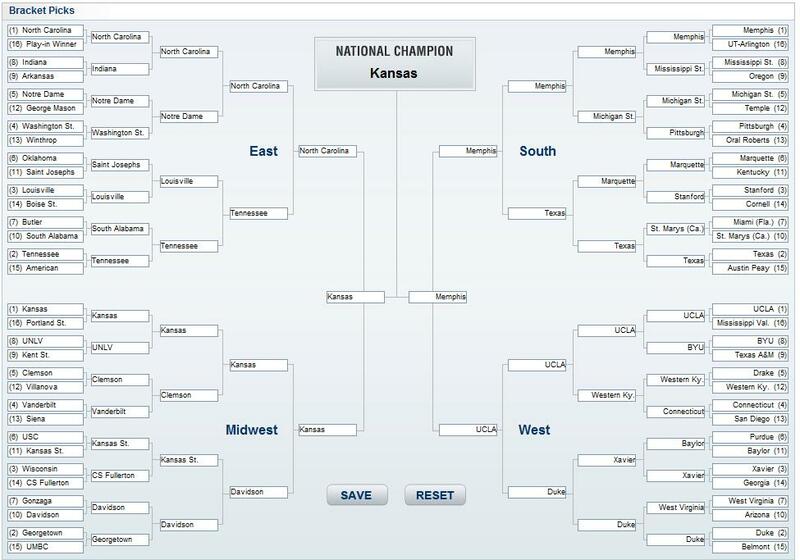 The bracket, I should note, is stolen from Facebook, because that’s the type of quality operation I’m running here. Yes, that’s three #14 seeds that are projected by the formula to take their first round games. Historically, the 14-over-3 upset has taken place 15 times in 92 tries — just over 16 percent of the time. In other words, it tends to happen roughly once every two years. So, three such upsets this year seems unlikely. Furthermore, when a #14 seed does advance, it rarely gets much further. Only twice in 15 tries has a #14 seed followed up a first-round upset with another one in the second round — potentially tough news for this projection of Boise State. The hope was that weighting the formula with Pythagoras would sift through some of these unlikely upsets (Cal Fullerton over Wisconsin?) and produce a more realistic set of potential Cinderellas. So, did it? That looks a little better. And only three of those teams is projected to move deeper into the tournament, with Davidson projected to reach the Elite Eight. Ultimately, though, it’s all four top seeds left standing according to this projection — not bloody likely. With regard to Davidson, on one hand this formula has actually managed to be pretty reliable in terms of picking upsets and sleeper teams during the year. On the other hand, I’m not sure I completely trust Davidson because of the team’s imbalance. Over the past few years, I’ve made a habit of picking against tournament teams that lean heavily on a single scorer, particularly if the majority of those points come from outside the paint. The thinking is simple: if that one scorer happens to be off, the team is pretty much screwed. This is why I picked against Duke when it was the J.J. Redick show and Syracuse after Gerry McNamara carried the Orange through the Big East tournament. (It also helps that I hate both of these teams). There are a lot of interesting questions to be answered in this year’s tournament: How long can Davidson keep its streak alive? Has Georgia turned the corner at just the right time? Can George Mason revisit its success of two years ago? Can Memphis prove its doubters wrong? Will this be another big year for the mid-majors? And there are plenty more to be asked. Luckily, we won’t have to wait much longer to learn the answers. We’ll be back routinely throughout the next couple of days to cover some of the bigger stories of the early rounds of this year’s NCAA tournament. Part 22! The Mid-American Conference! Yet another conference that I don’t have a lot of exposure to. Here’s what I know. I know that Miami of Ohio pulled a bit of a Cinderella act last year en route to a tournament berth last year. I seem to recall a buzzer-beater getting them to the Dance, in fact. Over Akron. I seem to recall seeing the highlights of the game’s finish while in Portland last year. Ah, hell. Why rely on my memory? YouTube’s got it. Can Miami pull it off again this year?